As a kid I occasionally used to get to go on road trips with my grandmother during summer vacation. She would load up the car, and we would head off through Florida, to Georgia, the Carolinas, or Tennessee. I could sit and watch the little towns and kudzu covered telephone poles give way to the hazy view of low mountains in the distance. It was a great change of venue from the Gulf Coast, roaring along in a big Chrysler past the red clay shoulders and pine forests of the Southeast. The other thing that was great about these trips was the biscuits. Usually there would be a brown paper lunch bag, filled with homemade biscuits, each with a thin slice of country ham in the middle. I think they were supposed to last the trip, but seldom made it past lunch. 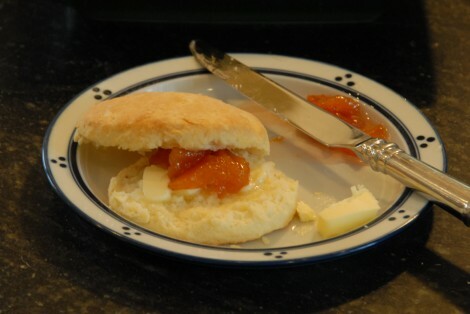 The biscuits were airy and light, with a few layers and a flaky, crispy crust. They were mixed up in minutes from a bag of self-rising flour, and I don’t think I ever saw a measuring cup being used. The biscuits we never rolled out, just patted into form and cut with an old aluminum biscuit cutter with a wooden handle, the red paint having long since worn off. There are many types and variations on biscuits but these are the biscuits I remember from childhood, and the ones that I struggled to recreate. Struggled, because like many people I wanted to overwork the mixture and couldn’t leave well enough alone. 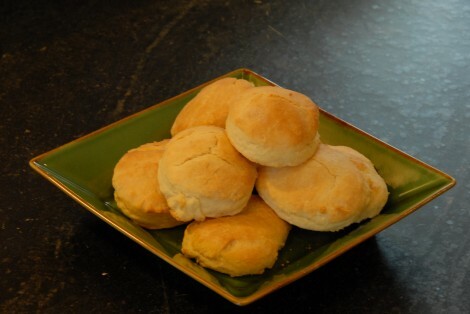 Biscuits are meant to be made quickly, unfussily, pulled together and tossed into a hot oven. The more your warm fingers contact the cold butter or shortening, the more you stir in the milk or buttermilk, the shorter and tougher the result. Finally, on an impulse, I ordered Nathalie Dupree’s Mastering the Art of Southern Cooking. Yes, I linked to the hardback – it’s worth it, and not just for the biscuits. If you aren’t familiar with Nathalie Dupree, she has been a Southern cook and cooking educator for decades. I remember watching her on PBS in the 80’s, and she brought a new perspective to what I considered (erroneously) at the time to be a dated cooking style. Natilie Dupreee also has a book just on Southern Biscuits, but the biscuit section of Mastering the Art of Southern Cooking gave me the trick I needed to get a great result. The trick is cut your butter (and/or shortening) into different sized pieces, and then work those to a different end result. This is great, as it works great when working the dough with your hands. No food processors, no pastry cutters — just fingers in a bowl full of flour. It’s also a great training ground for improving your pie or tart crusts. Armed with this new tip, I started turning out perfectly respectable biscuits. I know that there are Southern cooks out there who make biscuits everyday, and whose results rise higher, are flaky-er, and lighter. I’m not claiming biscuit perfection, or even excellence. But, I can now make a really good batch of biscuits in less time than it takes for my oven to preheat. That means, for a start to finish time, my homemade biscuits are just as fast as baking canned or frozen biscuits. Note: The best flour for making biscuits is a Southern, soft-wheat self raising flour. I use White Lily, which is thankfully available on Amazon. It has completely changed the outcome of my biscuit making. If you don’t have access to a soft wheat flour like this, and don’t want to order any, you can mix cake flour with all purpose flour in about a 50/50 ratio — and then don’t forget to add in about 1 Tbs (15 ml) of baking powder and 1 tsp (5 ml) of salt for 2 cups (480 ml) of flour. Cut half of the butter into 1/4 inch (5 mm) pieces, and the other half into 1/2 (inch 1 cm) pieces. You may want to return the butter to the refrigerator if you have spent more than a few minutes on this. Place the self rising flour (or flour, baking powder, salt mixture) in a bowl. Add the 1/4 inch butter to the top of the flour, and rub the pieces of butter between your fingertips and your thumbs, quickly pressing the flour into the butter and then dropping the pieces and moving on the next set of butter chunks. Sift through the flour with your fingers, picking up butter pieces and snapping them into the flour until the mixture looks like coarse sand. Add the 1/2 inch pieces of butter, working into the flour in the same fashion as the smaller pieces. However, stop working the butter when the largest chunks are the size of lentils or split peas. At any time, if the butter seems to be melting in your fingers and soaking into the flour, stop. Place the bowl in the refrigerator, and wait 10 minutes until the mixture is chilled again. 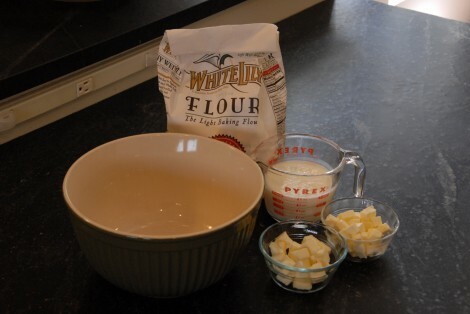 Once the mixture resembles the picture above, add the buttermilk or milk and stir just until the dough forms and begins to pull away from the sides of the bowl. If the mixture is crumbly, add another tablespoon (15ml) or two of liquid just until there is not loose flour. 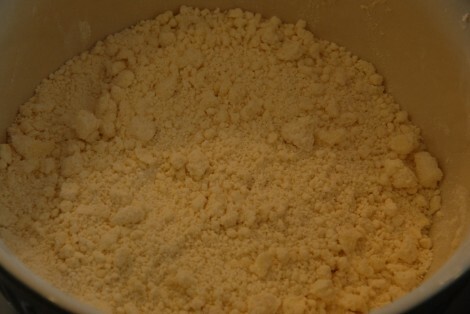 If the mixture is too wet, add flour by the tablespoon full until the dough forms and pulls from the sides of the bowl. It should be a loose, wet dough. Flour a smooth hard surface for working the dough, a plastic sheet or stone counter top. Turn out the dough and sprinkle some flour on the surface, and then pat the dough out to a 1/2 inch (1 cm) thickness. Using a dough scraper or spatula as needed, fold the dough in half, sprinkle with more flour, and repeat. Fold and pat out a third time, and then fold the dough and pat into a 1/2 – 3/4 inch (1.5 – 2 cm) thick smooth sheet. Coat a 2 inch (5 cm) biscuit or sharp cookie cutter with flour, and press down to form the individual biscuits. Repeat for the whole sheet of dough. With a spatula or dough scraper, place the biscuits on an ungreased cookie sheet. Merge the dough scraps and press out, cutting more biscuits until complete. These may not be as fluffly, but will be perfectly fine. Bake for 12-15 minutes, until golden brown. After 6 or 7 minutes rotate the pan for even baking. Allow the biscuits to rest on the pan for a couple of minutes, and then transfer to a plate for serving. By the way, these go great with Fried Chicken.